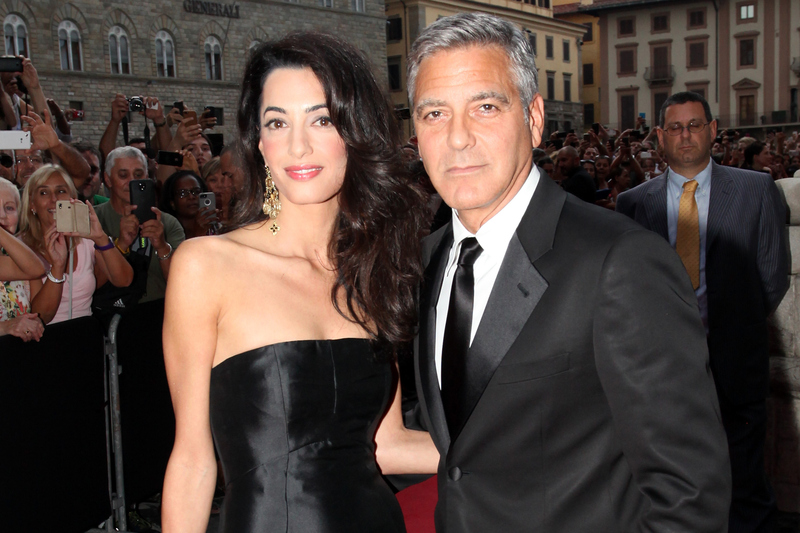 There are a lot of reasons to be jealous of George Clooney and Amal Alamuddin. They're rich, they're famous, they're gorgeous, and they get to be married to each other. What's not to envy? When Clooney and Alamuddin got married in a lavish four day Italian wedding that was everything the rest of us could only dream of happening, those who weren't waiting with bated breath to see her dress were waiting with bated breath to hear about the honeymoon. Or was that just me? As it turns out, their honeymoon was the exact opposite of the high expectations their wedding set for it. Apparently, Clooney and Alamuddin are honeymooning in their British home for a week — the ultimate staycation, if you will. According to US Weekly, the house in England was purchased by the newlywed couple on September 27 and the two will be sequestering themselves off in it without family, friends, or a live-in chef. "A small private catering company delivers their meals every day," said the US Weekly source, who also added that, "[Clooney and Alamuddin] wanted a simple break. Just somewhere to enjoy time together with no interruptions." That should be great news, right? I mean, staying at home for a week is the kind of honeymoon we can all afford so we don't need to be jealous of them anymore. Then why do we still feel like we're going green with envy? Here are five reasons Clooney and Alamuddin's honeymoon makes you just as jealous as their wedding did. Their British mansion is described by US Weekly as "set back from the road, in the remote British countryside... luxurious, well decorated and super-private." I bet your house ranges somewhere between a multi-room suburban house with a double mortgage to a cramped apartment split among numerous roommates. You know why? Because you're not rich and famous and neither am I. That's why we normal people leave our homes for our honeymoons. Can you afford to have a private catering company bring you all of your meals for a week so you don't actually have to turn on a stove to cook for yourself? Three meals a day? Really? Let's stop deluding ourselves here. If we decided to stay home for a week as our honeymoon, we'd have to do all of our own cooking for sure — even if we at least went out to eat for dinner. Did I mention the part where they had a lavish Italian wedding that spanned over four days? Four days? In Italy? 100 cases of tequila? Yeah, after a wedding like that then there was no need for them to jet off somewhere else for an equally lavish honeymoon. They've already shown the rest of us that money is no object for them. No matter what they do or don't do, they're still Clooney and Alamuddin. And we are not. And that is a true tragedy. When's the last time you can remember being able to afford taking an unpaid vacation from work for this long, let alone for a week of staycation honeymoon time? To be fair, we don't know if Alamuddin is getting unpaid vacation from her law firm in order to get married, but Clooney certainly isn't getting paid to stay home for a week. Or is he? Does he collect money just for being Clooney? It wouldn't surprise me at this point. Excuse me while I sit in the corner and feel really, really jelly.